My father had a bone infection when he was a child and ended up with his left leg being shorter than his right. Very, very long story short, he ended up receiving care from Shriner’s Children’s Hospital in Salt Lake City over the space of a few years, all for free. His family was not in a position to pay for such extensive care. He had 3 rather radical surgeries and spent 363 days combined in the hospital during his 3 stays. Almost an entire year! I just can’t wrap my head around that. During the course of these surgeries, they lengthened his left leg and stopped the growth in his right leg so it didn’t end up 6-7″ longer than his left leg. To think about life for my dad if he hadn’t had the help from Shriner’s, it would have been completely different. I get emotional and teary eyed just thinking about it. He was able to serve an LDS mission. Because he was surrounded by so many doctors and smart nurses, he decided to become a doctor instead of a music teacher. My life would be completely different were it not for the angel Shriner’s. I really, really enjoy donating quilts to charity. For those of you that follow me on Instagram, you probably roll your eyes when you see me post about yet another set of blocks I’ve made for something or yet another quilt. I really feel like this is why I am so blessed to quilt, to be able to bless the lives of others. The fabric for this cute quilt was sent to me from a dear friend and I knew when I saw it that I would make it into my first quilt to donate to Shriner’s. I am sad to say it has literally taken me almost a complete year to get this done. 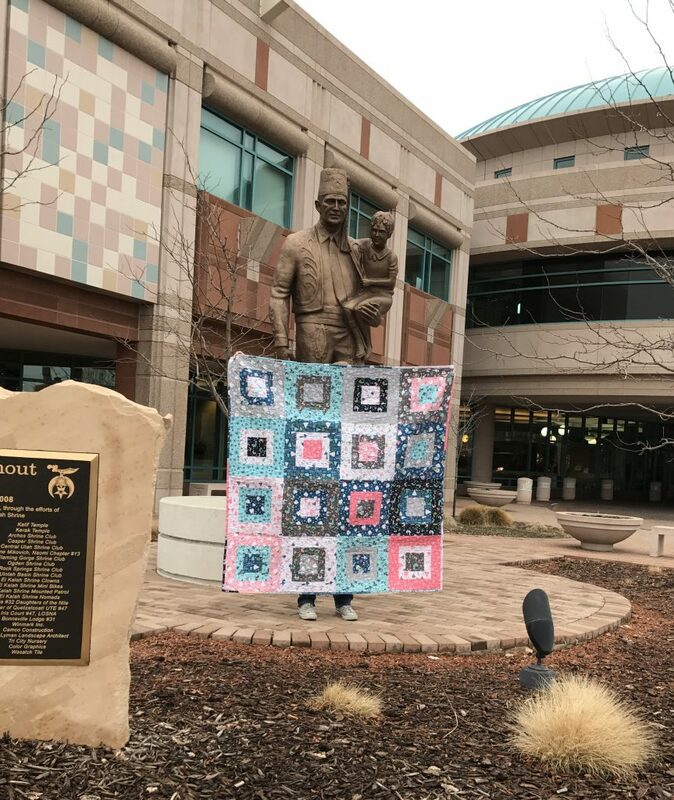 Yesterday I dragged my 2 boys up to Shriner’s in SLC to donate this quilt in person (this photo was taken by my 5 year old… he’s ready to graduate from quilt photo school, I tell you!) I was a sobbing mess, explaining to the volunteers at the front desk why I had chosen to donate this quilt to them and thanked them for the care their organization gave to my father. While we were there, almost everyone who came in through the front door was a child in a wheelchair, most certainly donated by the Shriner’s. If you have any quilts you are wanting to donate, please consider the Shriner’s. Especially here in Utah, they are so very often overlooked for a different children’s hospital. Both hospitals do wonderful work, but my donations will always go to Shriner’s, for obvious reasons. If you’re interested in donating, you can find information on locations by following this link. I know they will gladly accept quilts via the mail. This entry was posted in Charity Quilts. Bookmark the permalink. I love this post! Shriner’s is such a wonderful hospital. I’m sure the quilt you donated is well loved.